G’day, I’m Alicia ‘Eesh’ Ferguson and welcome to my blog! It’s been just over two months since I began a new career as a Senior Researcher with the TV production company, Sunset + Vine, and I can honestly say I’ve never had as much job satisfaction (apart from being a footballer). Sunset + Vine won the contract to produce the 2013 Women’s UEFA Euros in Sweden for the BBC which was great for me because it meant they needed some ‘inside’ knowledge on women’s football. My first few jobs were to contact some of the Lioness players (England that is, not my beloved Millwall Lionesses) to build background stories for the BBC coverage. I’m sure you’ve heard the theory that people throughout the world are only twice removed from each other? Well, I can’t necessarily prove that theory, but I have to agree with it when it comes to the world of women’s football. It’s always easier talking to players and coaches you’ve never met when you have a shared contact or interest. Talking to the England players and hearing their stories about playing football despite being faced with all kinds of adversity brought back memories of my own childhood. Every player has a unique and inspiring story which I hope, and believe, will endear them to the British public during the Euros. Our crew headed up to England’s new National Football Centre, St. George’s Park, to the first of two Euro preparation camps for the Lionesses. We spent two days filming interviews, promos, opening titles and training for the BBC coverage. The first thing that struck me driving down the long entrance is how lush, green and rural the location is, highlighted by the amount of cows cruising around outside the rabbit proof fence. Yep, that’s right St. George’s Park is surrounded by 3.5 miles of rabbit fencing to keep those pesky bunnies off the 12 perfectly manicured pitches! Not surprising they’ve gone to all that trouble seeing as the England Women weren’t even allowed on a pitch to get their squad photo taken. Apparently the chairs kill the grass. Huh?!? In all serious though, the facilities are exceptional and there’s nothing like the smell of freshly cut grass to make me want to lace up the boots and have a kick. Closest I got was some keepy uppy on the indoor 3G pitch, but I was having a shocker attempting that in skinny jeans and converse. I nearly split my pants at one point! Not cool Eesh, not cool. Facilities like St. George’s Park are by no means a new thing in other parts of the world; in fact numerous training, education and research facilities were visited and consulted to ensure the feasibility of a National Football Centre. But it is definitely the first of its kind in Britain and will go a long way to improving the development of the nation’s coaches and athletes. 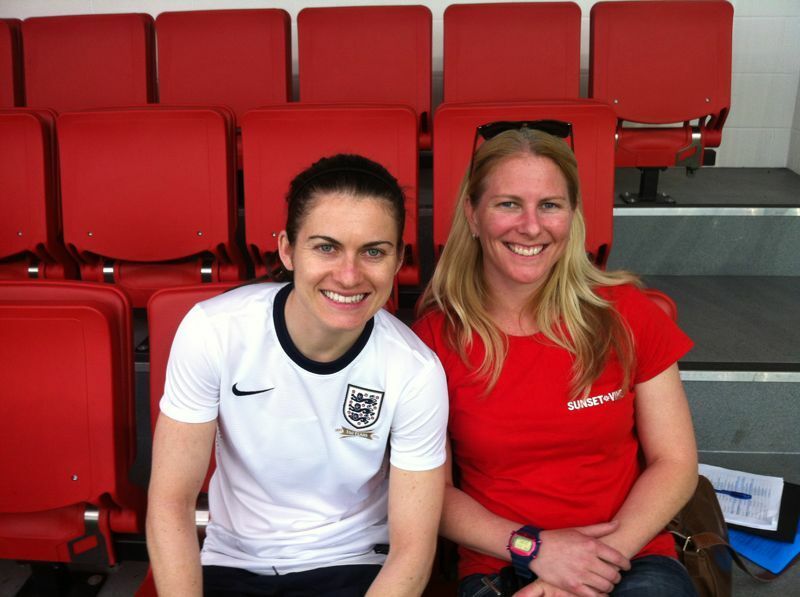 I was having a chat to Kaz Carney and Kelly Smith about their rehabilitation at St. George’s Park. They were spending 4-5 days a week there seeing the physio and doing their rehab program. I’ve been in their situation having had two knee reconstructions, and I know it’s not just the facilities and expertise that aid players’ development and/or recovery; it’s the psychological implications of knowing you’re in a world class facility that may just be the extra 1% you need to be successful. Let’s hope that comes to fruition for the England Women at the Euros! This entry was posted in Alicia Ferguson. Bookmark the permalink. A big season ahead, but we’re ready!